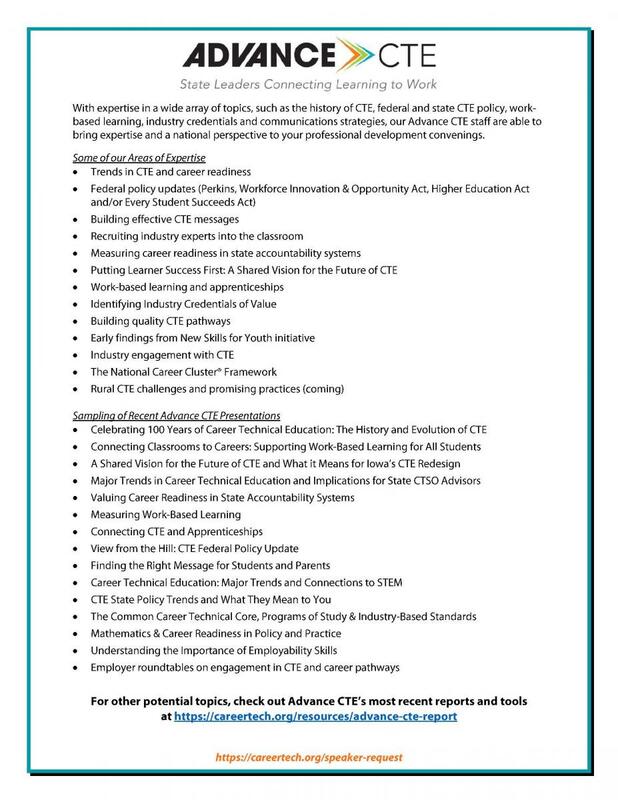 With expertise in a wide array of topics, such as the Perkins, history of CTE, programs of study, federal and state CTE policy, work-based learning, industry credentials and communications strategies, our Advance CTE staff are able to bring expertise and a national perspective to your professional development convenings or support you in your implementation needs. You can find a list of Advance CTE's areas of expertise and recent presentations here or look to Advance CTE’s most recent reports and tools for other presentation topics. Please fill out the form below with all of the necessary information to request a representative from Advance CTE to provide a presentation, workshop or other technical assistance to get the process started. As a member benefit for State CTE Directors, Advance CTE will waive any speaking fees for those requests submitted by the State CTE Director, leaving only the cost of travel and direct expenses. You can only select one option.